Prior to departure, we'll be looking at several targets with Mastcam color and ChemCam to try to characterize the chemistry and texture of this new terrain. We'll also be taking a ChemCam RMI mosaic of "Buchan Ridge," an upcoming area of exploration within the clay unit, to aid in navigation and traverse planning. We're driving up to the crest of a ridge so that we will be able to see down the other side, which is currently hidden from our view. The new terrain is so featureless, that visual odometry is having trouble tracking our position and measuring slip, which caused the rover to stop the sol 2304 drive early. 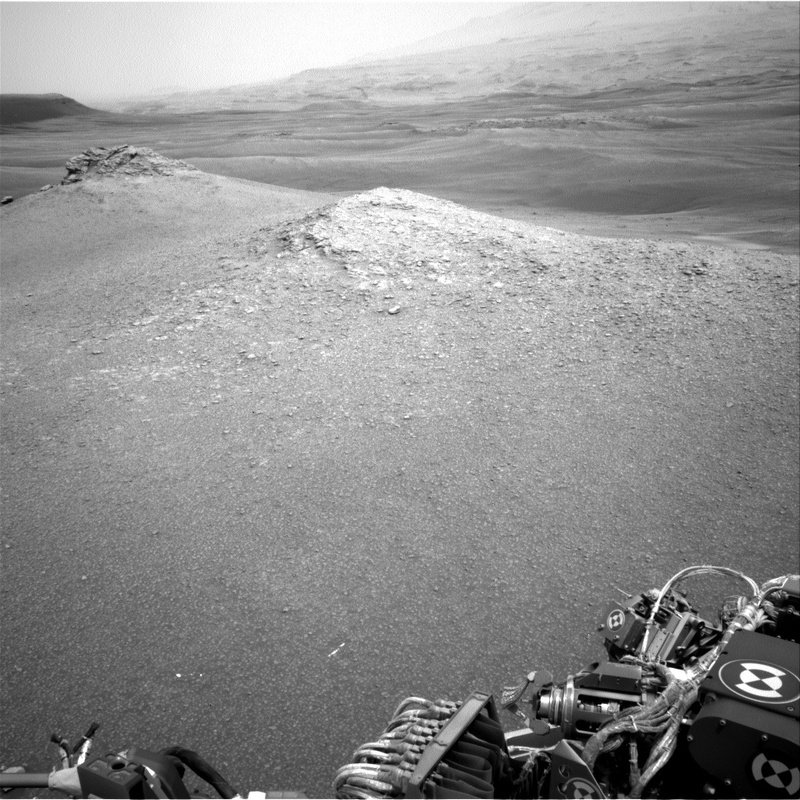 The image above (Sol 2304 post-drive Navcam) shows the ridge and the smooth terrain. The rover planners are using some extra imaging to help us characterize how the rover performs on this new terrain. We are hoping something of interest will be in our workspace for contact science in the weekend plan. Much of our post-drive imaging will also be of higher resolution than usual (lossless compression) so that we can see the fine details and get good stereo for drive planning. After the drive, we're continuing our monitoring of the weather, with Mastcam taus, dust devil movies, and some other atmospheric imaging. We'll also be using AEGIS for some automated ChemCam science, which should help us find anything interesting in this terrain. Last, but not least, we're continuing our diagnostics to better understand our issues with the Side-B computer, dumping some more blocks of memory.